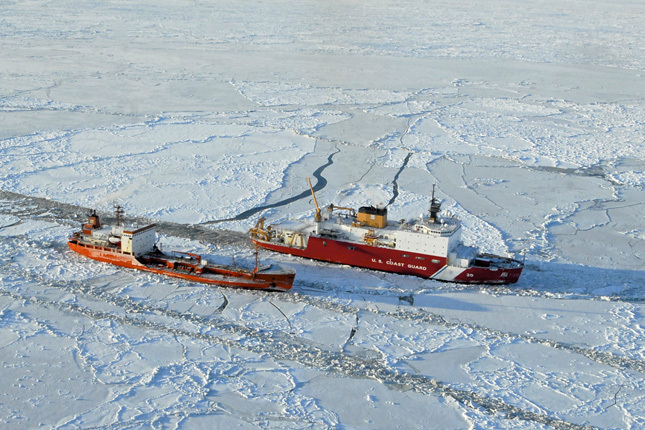 The Navy’s previous Arctic strategy was released in 2014, but the significant decrease in Arctic sea ice required an update to reflect the emergence of “blue-water Arctic operations,” now that the region has become ice-free enough for open waterways. Chief of Naval Operations Adm. John Richardson told reporters “the Arctic triggered [the update]” of the four-year-old Arctic Roadmap, which was originally designed to last 16 years. Is the United States Prepared for the Blue-Water Arctic? Other branches of the military and government agencies are planning for an ice-free Arctic—but not all of them. FEMA recently removed climate change from its strategy, which also makes no mention to the Arctic. The 2017 National Security Strategy does not mention climate change and references the Arctic only once. Both the Department of Defense and the Coast Guard have released Arctic strategies under the previous administration. The Department of Defense’s 2016 Arctic Strategy cited the need to identify the changing climate’s impacts “to operate safely and effectively in the region.” The Coast Guard, which, like FEMA, falls under the Department of Homeland Security, released its Arctic Strategy in 2013. The Air Force is currently developing its Arctic strategy, gathering senior leaders for a multi-site expedition to the Arctic region. Early last week, Air Force General Terrence J. O’Shaughnessy testified before the Senate Armed Services Committee regarding his nomination to become the commander of United States Northern Command (NORTHCOM), the regional command that includes the Arctic. Gen. O’Shaughnessy confirmed that the Arctic would be a priority for NORTHCOM, “Because as we look to the future, look at the strategic competition we’re in, look at Russia and China, and their activities there, that is clearly something that we need to also be focused on,” He also said that climate change “absolutely does” present strategic difficulties in the region. Last year, Prime Minister Trudeau released Canada’s new defense policy, which extensively discusses the Arctic, following the country’s first comprehensive review in more than 20 years. Its 10-year plan recommends five to six new ice-capable ships and partnering with the United States to modernize the North Warning System, among other Arctic proposals. During the review, the Royal Canadian Navy also released Leadmark 2050, its vision stressing the need for an Arctic-capable blue-water navy. Both China and Russia are investing heavily in the Arctic. Russia continues to build infrastructure along its Arctic Coast, including a new Arctic command and 14 new airfields. In January, China released its Arctic Policy, announcing its ambitions in the region. China and four other non-Arctic nations have joined the Arctic Council in recent years as observer states. But the Arctic Council, the leading international forum for negotiating Arctic issues, was not intended to handle the security challenges beyond its diplomatic remit. Founded in 1996, it promotes coordination between the eight Arctic countries on scientific research and sustainability initiatives, and explicitly excludes military security, as written in its founding charter. As Arctic security interests intersect more often with the region’s cooperative projects, the Arctic Council could provide a bridge to navigate the growing strategic interests in the region—or its work could sink under the pressure to seize the advantage in an ice-free Arctic. The relatively peaceful focus on science and exploration could be beginning to shift as the ice-free Arctic transforms the geopolitics of Arctic security. But deeper investment in military infrastructure must be accompanied by intensifying our efforts to strengthen international partnerships in the region. Steve Tebbe is a research assistant with Sherri Goodman at the Wilson Center. He is a graduate student at Georgetown University’s Master of Science in Foreign Service (MSFS) Program and concentrates on issues surrounding climate change and security. Photo Credit: The U.S. Coast Guard icebreaker Healy (WAGB-20) breaks ice around the Russian-flagged tanker Renda 250 miles south of Nome, Alaska. January 2012. U.S. Department of Defense photo by Petty Officer 1st Class Sara Francis, U.S. Coast Guard. Topics: China, climate change, environment, environmental peacemaking, environmental security, featured, Guest Contributor, military, polar, security, U.S. The clock has pretty much run out on oceanic security on this planet now suffering from global human overshoot. We’ve emptied the oceans of the majority of it’s edible biomass, polluted the seas with toxins, acids and nuclear fallout, and have already incinerated enough ancient carbon to raise sea levels several feet. Humanity is showing almost no signs of co-operatively slowing down these fateful trends. To pretend that investing in yet more militarism is going to “protect” us from such serial abuses is just another fear-based tax grab.